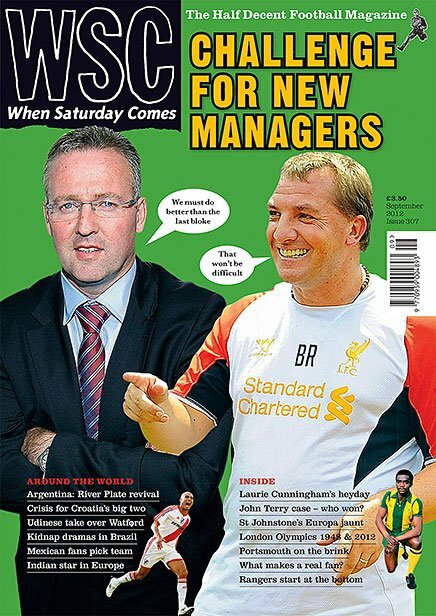 When Saturday Comes magazine is a little like Private Eye magazine when it comes to its witty covers. On the cover of the new edition, that previews the new season ahead, are two one-season Premiership managerial wonders both intent on proving they’re here to stay to build legacies with their respective new clubs. When it comes to doing better than the ‘last bloke’ though, I think Paul Lambert will have a much easier job than Brendan Rodgers. Lambert would just have to finish 15th and have some kind of cup run to outdo Alex McLeish. Rodgers, on the other hand, would need to win the FA and League Cup, then stir Liverpool to at least 7th in the League to pip King Kenny’s efforts. The pressure certainly is more on Rodgers’ shoulders. If Villa could sign two or three more top-draw signings and bed a team down quickly, Lambert might actually have a chance of leading Villa to finish above Liverpool. That would pretty much guarantee a decent first season in charge for the new Villa manager. I’m sure he’d take that scenario now, if it was offered to him. UTV.